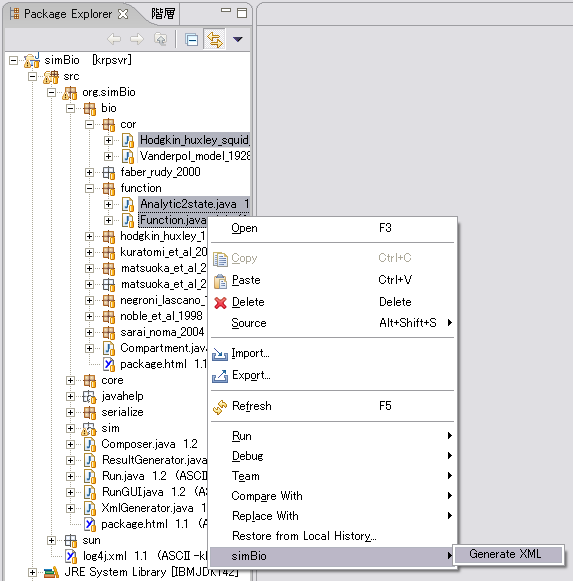 Execute simBio through pop-up menu of Eclipse Java Perspective. 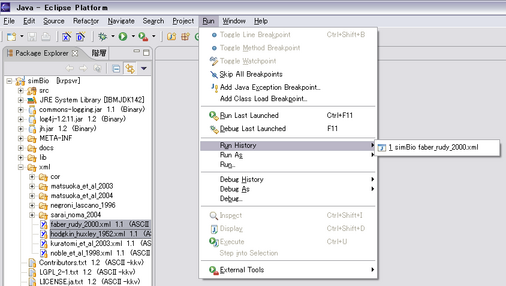 RunGUI, Composer, ResultGenerator, and XmlGenerator can be launched. You can find latest information from http://www.sim-bio.org/. This plugin is free software; you can redistribute it and/or modify it under the terms of the GNU Lesser General Public License as published by the Free Software Foundation; either version 2.1. This plugin is distributed in the hope that it will be useful, but WITHOUT ANY WARRANTY; without even the implied warranty of MERCHANTABILITY or FITNESS FOR A PARTICULAR PURPOSE. See the GNU Lesser General Public License (LGPL_2-1.txt) for more details. This plugin can be installed through update manager of Eclipse 3.x. 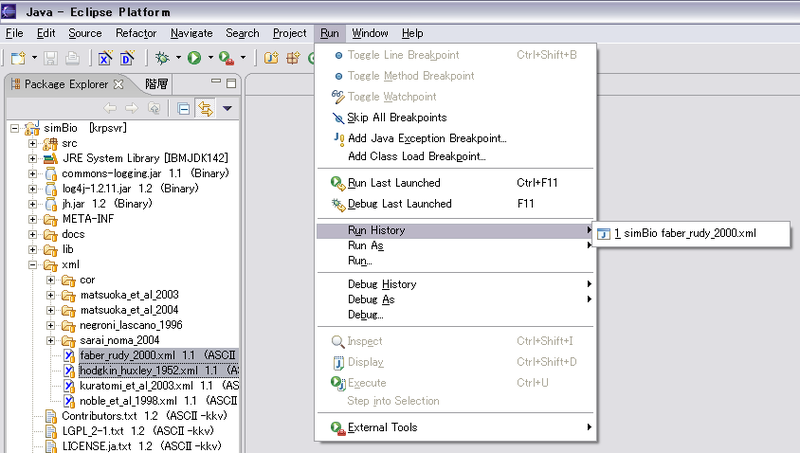 Here the process with Eclipse 3.1 is described. Select Eclipse menu: "Help" - "Software Updates" - "Find and Install"
Check "Search for new features to install", then "Next"
Input "Name:" box as you like such as "simBio", and "URL:" box as "http://www.sim-bio.org/eclipse/update/", then "Finish"
"Updates" dialog will appear, so check simBio, then "Next". Check "I accept the terms in the license agreement", then "Next"
"Verification" dialog will appear as not yet digitally signed. "Install/Update" dialog will appear, You can choose either "Yes" or "Apply Changes". 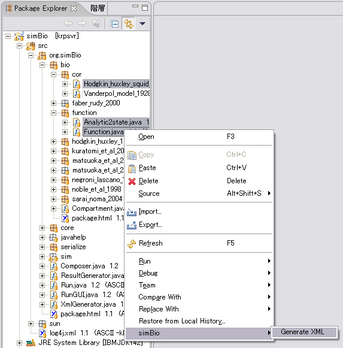 Unpack simBio_eclipse_x.x.x.zip and put org.simBio.eclipse_* directory in Eclipse/plugins directory. 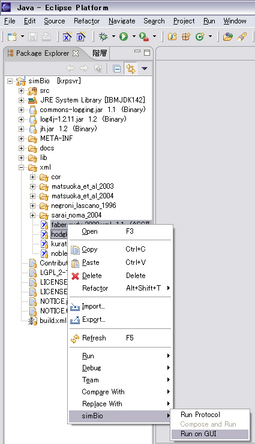 Right click xml files for simBio, then pop-up menu will appear. 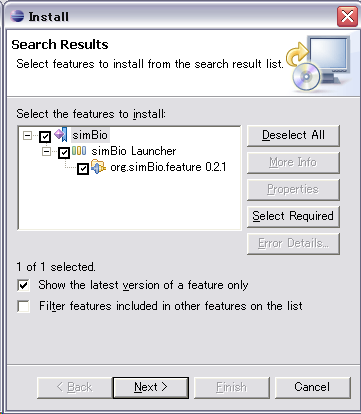 Select [simBio] - [Run on GUI], then the XMLs are executed on GUI. The Setting will be stored, then you can run it through the cool bottun. You can also run the previous settings through the menu, Run - Run History. Right click an xml file for org.simBio.Composer, select [simBio] - [Compose and Run], then a model xml will be composed and be run on GUI. 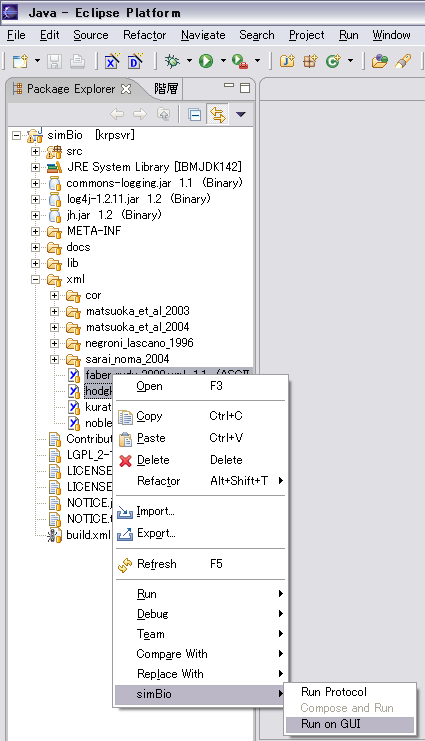 An "composed.xml" file will be created on the same directory, so you need to reflesh the view of Eclipse. Right click an model xml and an protocol xml, select [simBio] - [Run Protocol], then org.simBio.ResultGenerator will run the protocol. Right click Reactors and/or Analyzers, select [simBio] - [Generate XML], then XML files for the specific class will be created. Copyright (C) 2002-2005 Nobuaki Sarai and Contributors. The specific names are written in each file.